Ah, the keytar—the glorious keytar! Some might tell you that the keytar is the invention of a pianist with some serious guitar envy. We know the truth though. Keytars are an instrument made by the gods, designed to serenade the heavens with a siren’s song so sweet that it would make even angels cry tears of joy. Do you know who else knows that hidden truth about the keytar? Gene Belcher knows that and he takes every opportunity he can to share it with the world! 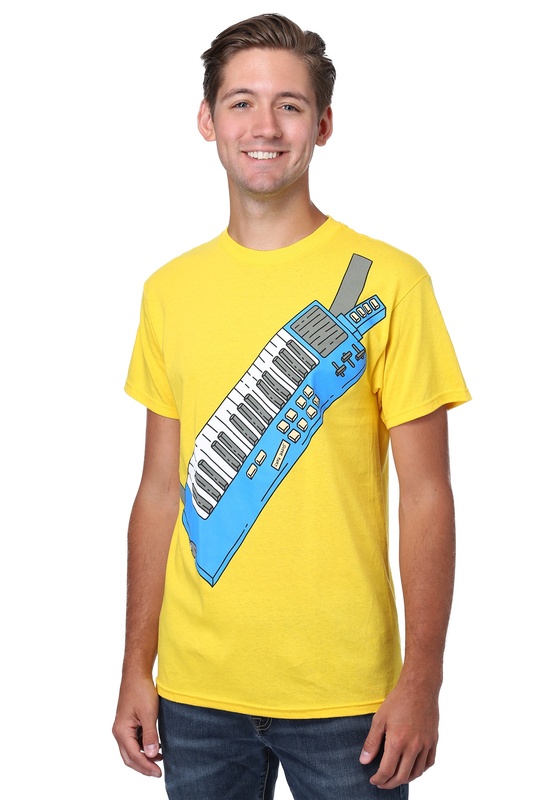 Now, you can be just like Gene with this Bob’s Burgers Keytar costume t-shirt. It’s based on the young Belcher’s instrument of choice. This licensed shirt is bright yellow, like Gene’s shirt from the show, and it has a printed blue keytar on the front. It’s made out of 100% cotton and it lets you create a quick cosplay look based on the character from the cartoon. Now get out there and spread the good word of keytar.